Four years ago, the students of the Government: American Politics and Policy major began the George Wythe Review as a forum for students to present their research on domestic policy issues in one of the nation’s few undergraduate publications. This year the editing staff applied for and received a grant from the Collegiate Network (CN), the student publication arm of the Intercollegiate Studies Institute (ISI). Through CN we were able to connect with a graphic designer who helped to redesign the layout, cover, and logo of the journal. We also attended the CN Editor’s Conference where we connected with other student publications and professionals in conservative journalism. 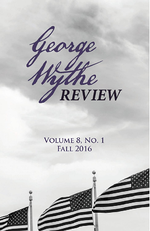 Even among other undergraduate publications, we found that the George Wythe Review is unique in its dedication to publish student rather than faculty research. In the vein of the journal’s namesake, the editors are committed to fostering an environment for discussion that enhances both the Government: American Politics and Policy major and the mission of Patrick Henry College. For the coming year the editing staff will apply for a larger grant and search for additional sources of funding so that we can expand the size of the publication and host several campus events to increase the journal’s campus readership.